Is circular reasoning always a fallacy? "I accept only one notion of land property. Namely, 'I am doing my stuff here, therefore I am here". "But this means," he responded, "you can break into any place and stay there, using this rule." "There is another rule, though. Right to act in its most natural sense, 'I am here, therefore I am doing my stuff here." "But do not these rules put together become circular reasoning?" "Of course, they do," I put my head closer to him, "and this is exactly that rare case when circular reasoning is not only sufficient, but is necessary." "But why is that? Circular reasoning never was a correct argument." "There are many circular things happening in nature. Life forms, for example, exist only in order to produce new life forms or to prolongate their own lifetime. Is there any reason to say this can't be the case for reason itself? Why must reasoning not be circular?" Can circular reasoning ever be justified? For example, we know all the words in our languages can't be defined using other words without the use of circularity. We know logic can't prove itself without circularity. Are these arguments rational? Are there any other arguments where circular reasoning is still rational? Geoffrey refers to feedback loops as a valid example of circular reasoning. This is not correct: they can be valid but they are not circular. Instead they are an example of reasoning by induction. It is not a implies b and b implies a. Instead it is an implies bn and bn implies an+1. That is valid so long as you can start it off with a0. For example, it is fine to say that people will distrust the economy if inflation takes off, and inflation will take off absent trust in the economy. However, you need some other reason for inflation or distrust to get going in the first place. It is not justified to accept any proposition if the only reason for accepting it cannot be justified without assuming the original proposition. It is a fallacy insofar as is doesn't generate support for a proposition, and thus is not a proof of its validity (while assuming the shape of a proof to the eye of the layman - that's why it is considered to be an error most of the time). On the other hand, it is an instrument to explore which other propositions are consistent with an initial assumption A. If A->B and B->not A (or any longer circle like that), you have proven A is outright impossible. If A->B and B->A (or again any longer circle like that), you have proven that A and B are compatible. This means they may eventually coexist and both be true in an imaginary world (not necessarily in our world). Remember, A might still be impossible if you take some yet untried C into consideration, so it's not a conclusive proof for A. But if you can't think of any such C, you might decide to take A as an axiom... one is still unable to prove A, of course, but now you can possibly generate valuable propositions like "under the assumption of A, the following interesting (formerly non-derivable) relationship holds: ...". 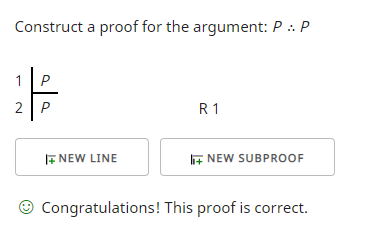 So circular reasoning has some application in deciding (most of the time: refuting) if any proposition A may be used as an axiom. Circular reasoning...is a logical fallacy in which the reasoner begins with what they are trying to end with. The components of a circular argument are often logically valid because if the premises are true, the conclusion must be true. Circular reasoning is not a formal logical fallacy but a pragmatic defect in an argument whereby the premises are just as much in need of proof or evidence as the conclusion, and as a consequence the argument fails to persuade. If whatever English sentence P is symbolized to represent can be determined to be true, then the argument is also sound. Nonetheless, the argument is an informal logical fallacy and it should not persuade those hearing it. As a side note this may be an example for my question whether there exists a sound and valid argument that is informally fallacious: Can an argument be formally valid with sound premises and still be informally fallacious? Circular reasoning means that a premise of your argument was the same as your conclusion. That means you haven’t established anything new. This can be useful if you’re stating a definition. Those need to give you back exactly what you started with, that is, be purely circular and tautological. You’re not supposed to introduce any new facts when you rephrase or simplify a statement! You will sometimes see people argue that the good kind of circular reasoning isn’t really circular reasoning but something else, because their definition of circular reasoning says it must be unsound. That is a good example of circular reasoning. If a more complicated argument turns out to be circular, all you did was waste your readers’ time. If people can’t agree on definitions, they’re actively harmful. You normally use definitions to rewrite a statement in an equivalent way. Rewriting your premise as your conclusion is circular reasoning. But that’s sometimes a useful thing to do! So: “Let us define man to mean adult male human. Socrates is a man. Therefore, Socrates is adult, male and human,” is logically sound circular reasoning. Not a very interesting argument, but a historian might legitimately need to explain that the primary sources say that Socrates was an anthropos, not a woman, a child, a supernatural being or a pony. Back when I was young and brash, I used to ask on the first day of each math class, “Is this where we learn why one plus one equals two?” Finally, a classmate of mine asked me, “You do know that one plus one is defined as two?” (When I told this story over on Math.SX, people objected that he should’ve said, “Two is defined as one plus one,” and it started a little argument about whether both are equally valid from a certain point of view.) So, for a real-world example, we say “2+2 = 4” because it’s more convenient than “(1+1) + (1+1) = 1+1+1+1,” but if I were asked to prove that 2+2 = 4, I would replace all the terms with their definitions, then invoke the axioms that addition is associative and equality is reflexive. That is, we would show that “2+2 = 4” is a tautology under the definitions of 2, 4, + and = that the people we’re writing the proof for accept. So that’s one way the same “circular reasoning” might or might not be accepted even in mathematics. There are still some forms of reasoning-from-definitions that are always considered fallacies, though: mathematicians would (almost always?) not accept a definition that introduced new premises. So, for example, you would not be allowed to define “the upper and lower floop of n” as “the lowest integers a and b, respectively, such that a/b × a/b = n” and then claim that the square root of 2 is rational by referring to “the floops of 2” as if such things existed. You’re no longer just making the exact same statement in an equivalent way; you’ve smuggled in a new premise, that the number 2 has floops, and it’s the exact same thing you’re trying to prove (that some fraction a/b is the square root of 2). Likewise, everyone agrees that it’s a logical error to use Theorem 1 to prove Theorem 1, or—more likely to be an honest mistake—prove Theorem 1 from Theorem 2 and then use Theorem 1 in the proof of Theorem 2. Most math professors will therefore insist that you cannot use a theorem introduced later in the course to prove a theorem introduced earlier, unless you can prove the later theorem from earlier theorems and only earlier theorems. This is to save you from this form of circular reasoning. Once you’re no longer a student, this doesn’t work (or rather, it might be possible to enumerate the theorems of mathematics and enforce a partial ordering on them, but mathematicians haven’t), so it becomes especially important to declare the premises of your results explicitly, not smuggle any more in, so that other mathematicians can tell if using your result will make their own proof circular. When you follow a debate that gets beyond formalism into value judgments (or, bless your heart, get into one), there are a whole lot more ways for this to go wrong. A lot of the words we use about ethics are loaded. Everybody¹ agrees that words like fairness and justice mean that something is good, and words like murder and abnormal mean something is bad. ¹ That is, everybody it’s possible to have a productive conversation with at all. Circular reasoning is a fallacy because circular reasoning is defined as being fallacious. If it's not a fallacy it's not circular reasoning. How's that for circular? If you have a conclusion that is true because the premise is true, and the premise is true because the conclusion is true, there is nothing outside the loop proving either true. This pure circular reasoning is a fallacy. If, however, the premise or conclusion is supported by some other logic, the circularity is irrelevant and this isn't an example of circular reasoning. On the left you see circular reasoning with no foundation. On the right you see irrelevant circular reasoning based on some other foundation. Reasoning and logics are based on causality: if a [cause] occurs, then a [consequence] will occur. Circular reasoning breaks causality: a consequence cannot be the cause of itself (in case of a singular causal proposition). You can chain several causes and consequences, but if you create a loop, you break causality: A->B->C->D->A is wrong, a cause cannot trigger a previous consequence. Your example is a common error, a correct result obtained from bad reasoning. That happens. WHEN asked why the economy in a certain state is in a slump, an economist replies: "A lot of people are leaving the state. Things are very poor in the building industry, for example, because there is no need for new housing." Next question: "Why are people leaving the state?" The economist's answer: "Well, the state of the eco? nomy is poor. People just don't seem to be able to get jobs, with the economy being so slow at the moment." This sequence of questions and answers has taken us in a circle: the economy is depressed because people are leaving, and people are leaving because the economy is depressed. Isn't this just the sort of argument that might be cited in a logic text as an instance of petitio principii, the fallacy of arguing in a circle? If so, it seems that the economist's argument must be fallacious. On the other hand, perhaps the circularity in his argument could be due to the feedback loops inherent in human behavior. If people leave, things get worse. But if things get worse, people leave in even greater numbers. An analogy could be to the following case. The more overweight the diabetic gets, the more insulin there is in his blood. The more insulin there is in his blood, the more he tends to eat and thereby store up more fat. Here the process is circular, but there seems to be no fallacy. At least, from one point of view the circle is not vicious, since the diabetic gets fatter and fatter. Similarly, in the previous case, the state could become more and more economically depressed, as the cycle progresses. In mathematics, it is common practice to start at proposition A and then prove B, then start again at B and prove that A follows. An equivalence proof in mathematics, of the if and only if type, often takes this form. Although the form of proof is circular, in many instances such a proof is rightly thought non-fallacious. And some notions that are circular, like Russell's "set of all sets that are not members of themselves," were found troublesome not altogether because of the circularity involved, but because they contain a contradiction. These examples may suggest that circular reasoning is not always fallacious or vicious. Some philosophers have even carried this further to argue that scientific reasoning itself may be inherently circular. Hull (1967) examines the questioning of their own methodology by evolutionary taxonomists. The taxa, or categories of organisms used by biologists are applied to the study of particular organisms to represent evolutionary descent. But as more is learned about the principles of descent with modification by such studies, the taxa are refined and improved. This process has seemed circular to some scientists, and it has been called "groping" and "reciprocal illumination" to indicate the suspicion of circularity. According to Hull (1967) the process is circular only to the extent that scientific verification of hypotheses is always circular. Douglas N. Walton, 'Are Circular Arguments Necessarily Vicious? ', American Philosophical Quarterly, Vol. 22, No. 4 (Oct., 1985), pp. 263-274. David L. Hull, "Certainty and Circularity in Evolutionary Biology," Evolution, logy," Evolution, vol. 21 (1967), 174-89. Both circular and inductive reasoning suffer from the same flaw: where do you start? After all, the purpose of logic is to create new truth that follows from prior truths, also known as 'proof'. With pure induction, it's as is said 'turtles all the way down'; that is to say any premise can be required to, itself, be induced from something else, leaving no ground to start from. With circular logic, the start is arbitrary as you're constructing a ring. All points can be considered starts and ends equally, but ultimately it can be reduced to a very simple form: A -> B only if B -> A, but B -> A only if A -> B. The combination of two dependent conditionals regresses infinitely much like induction, just down the circle rather than to infinity. Both systems lack an antecedent that does not require further justification: an axiom. Axioms are not without examination within the grand scheme of things, but for the sake of any argument are required. Axioms are often used without being identified as such, but they are critical to any reasoning that isn't fallacious, which is what many failed arguments fall into: not a failure of reasoning, but a failure to identify any common ground from which to start from. Where circular reasoning can trap people into thinking it works is with identity. Identity is circular as something will always equal itself. However, if you pose something else that /seems/ different as equal to the other, the reverse will be true and it might feel like you've proved something. Descartes broke the mould on that one with "I think, there for I am." By separating thinking and existing as two things and trying to reason a causality between them, you create a circle that doesn't prove anything. It's also worth noting that circular reasoning being fallacious does not disprove the thing in question, but rather fails to prove it by those means. Circular definition of words do not start that way; we know that babies do not speak, so they must bootstrap their language in non-verbal ways. However, those foundations are lost once language builds a self-integral web. The justification for the veracity of the initial foundations may be forgotten, but that isn't to say it didn't exist at all. can both be true at the same time. Both invidious effects are caused by each other in a never ending cycle of obesity and misery (and Mike Meyers movies). For example, "His argument is wrong because he is stupid" is an example of the ad hominem fallacy. However, just because this is a fallacy doesn't mean he is smart. Similarly, "We shouldn't trust his claim to be an expert witness as to the accuracy of this complex proof" is not a fallacy. In many of the cases you describe we aren't really talking about arguments, so fallacy wouldn't apply. Sometimes reasoning isn't an argument, but a statement of a belief system. For example, someone may state that they only believe things that can be scientifically proven. If they respond to the question "Why do you believe science works?" with a scientific publication, this shows that this question does not show that their belief is inconsistent. If they do not also use it as an argument for science, it is not a fallacy. Broadly a belief system may be described as foundationalist or coherentist. In foundationalism there are some axiomatic beliefs that need no justification, circular or otherwise. Coherentism, allows for any proposition to be questioned, but only has other beliefs against which to test the proposition. This isn't necessarily a fallacy. For example, showing that A -> B, B -> C and C -> A means that any evidence for B and C is now also evidence for A. In each type of belief system, some beliefs are not supported by non-circular justifications. According to my 9th grade geometry teacher, axioms are unprovable, but everything is built on them. Hence, an axiom can be viewed as leading to circular reasoning (as can a dictionary, because eventually, all words are defined by other words, etc.). This means, "no", it is not a fallacy. However, "circular reasoning", by itself, doesn't prove a case either. Also, many arguments have hidden circular reasoning within them. This must be watched-out for. If you were to successfully travel backwards in time, and then attempt to change something that would have changed your own past so that you would not travel back in time, something will happen so that you are not successful. In General Relativity, the result of attempting this is the new something that appears has a causal loop and physics becomes nondeterminsitic without invoking any quantum rules. Arguments about what happens within such a causal loop are circular and there is no fallacy because that is the construction of the underlying physics. If the debate becomes "which form will it take" it literally cannot be resolved without trying it. (Pro tip: Don't try it. You are likely to not like the result.) One of the circular arguments may be correct or perhaps none of them. But if the debate is within the path of a single such loop, the circular argument is resolvable despite being circular. Can an argument be formally valid with sound premises and still be informally fallacious? What exactly is the value of completeness and decidability in logic? What is the fallacy of defining a square as “a closed-plane figure whose sides are all equal”? Can there be true conclusions without assumptions? Does anyone know of a philosophy which rectifies or considers the following question? Can the principle of sufficient reason be applied to the whole of existence? Is the reiteration rule in formal logic begging the question?